New York: Duell, Sloan and Pearce, 1946. First edition. Octavo, original cloth. 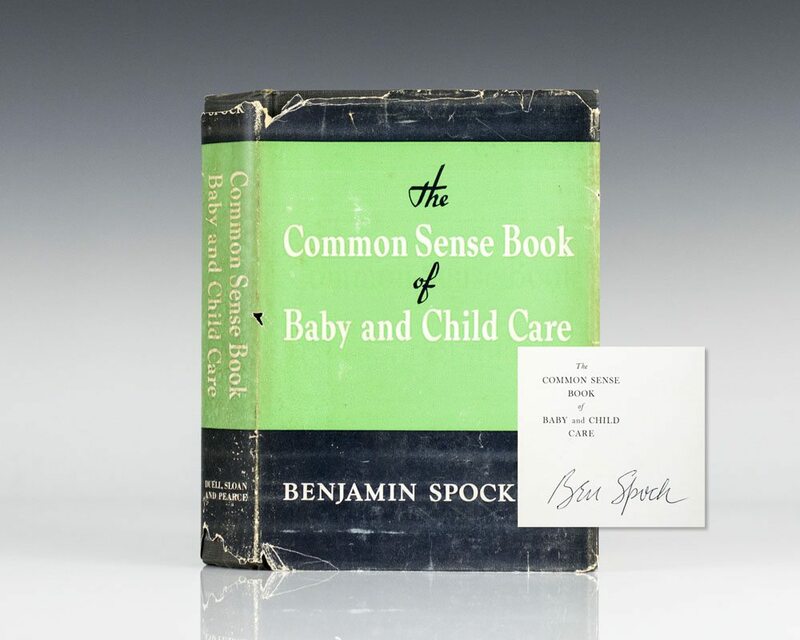 Signed by Benjamin Spock on the half title page. Near fine in the rare dust jacket which has some chips and tear to the front, spine and rear panel. Housed in a custom half morocco clamshell box. Exceptionally scarce, especially in dust jacket and signed. 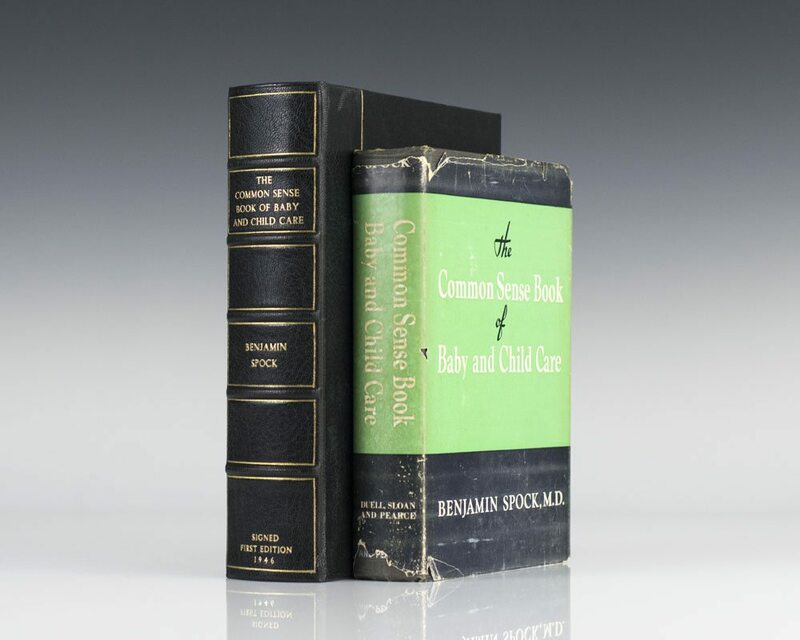 "The Common Sense Book of Baby and Child Care has sold over 50 million copies since its publication in 1946 making it the best-selling book of the twentieth century in America, aside from the Bible" (Maier, 2003). As a practicing pediatrician in the 1930s, Spock noticed that prevailing methods in pediatric care seemed cruel and ignored the emotional needs of the child. He wanted to explore the psychological reasons behind common problems seen during practices like breastfeeding and toilet training, in order to give less arbitrary advice to mothers who came to his practice. He thus became trained in psychoanalysis, emerging as the first pediatrician with a psychoanalytic background. Seeking useful ways to implement Freudian philosophy into child-rearing practices, Spock would try out his advice on patients and their mothers, continuously seeking their response. He contradicted contemporary norms in child care by supporting flexibility instead of rigidity and encouraging love for children by their parents. Named by The Library of Congress' list of 88 books that shaped America. Veto message on the Adjusted Compensation Act, 1935: Address of the President of the United States in the House of Representatives, Delivered May 22, 1935. Washington, D.C.: United States Government, 1935. Speech given by President Franklin D. Roosevelt in 1935. Signed by Roosevelt at the conclusion of his speech. In near fine condition with light wear. Rare. On Economic Theory and Capitalism: Collected Papers. Oxford: Routledge and Kegan Paul, 1955. First edition. Octavo, original cloth. Nobel Prize-winning economist Amartya Sen’s copy with his name “A.K. Sen Trinity College Cambridge” on the half title page. Inscribed on the front free endpaper to Sen, “For Amartiya With the confidence that he will plan the dynamic economy, of a socialist and peaceful India. With best wishes, Arif Cambridge 8 May 1955.” In very good condition. Sharpe’s Company. Richard Sharpe and the Seige of Badajoz, January to April 1812. Maguire, Mairead Corrigan; Preface by the Dalai Lama; Foreword by Archbishop Desmond Tutu. The Vision of Peace: Faith and Hope in Northern Ireland. First edition. Octavo. Fine in wrappers. Warmly inscribed by Maguire as follows, “To ______ Peace to you. Love Mairead Corrigan Maguire.” Also inscribed to the same recipient by Nobel Laureate Desmond Tutu; who contributed the foreword. Also laid in is a pamphlet inscribed by Maguire, “A Letter to My Son Luke.” Uncommon especially signed by both these Nobel Peace Prize winners.